Some people ask me, “What use can Rafael Nadal have for a watch when he’s playing?” But Nadal explained to me after he won the 2010 French Open that during the semi-final, which was a very challenging match, there were critical moments when he wanted to check the time. I asked him why, and he said that on the court there is absolutely no time — there is an elapsed-time measurement, but not a reading for the time of day. He wanted to know what the condition of the light would be, and also if he were to go on for a certain number of sets, whether they would have to come back the following day. Finally, it was thanks to the accidental intercession of the king of Spain that he considered it. One day, Rafael had dinner with the king and he mentioned that he had been in contact with me. He asked the king, who is a well-known watch lover, if he had heard of me. The king laughed and said, “Richard Mille — it’s my favourite watch!” And he pulled up his sleeve to show Nadal his RM 009 tourbillon. He explained how much he loved the watch and how comfortable he found it, and this ended up being an important moment that would lead to our collaboration. The thing that was interesting about convincing Nadal was that everyone knows that he is a total maniac when it comes to preparation and details. When he comes onto court, he has to arrange his drinks in a certain way; he has a certain routine and he cannot deviate from this in any way. For 15 years, he played with exactly the same tennis racket despite the rapid evolution of technology in the field. Finally, in 2009, he was having some knee problems and his uncle took advantage of this time to change his game as well as change his racket and a few other things. 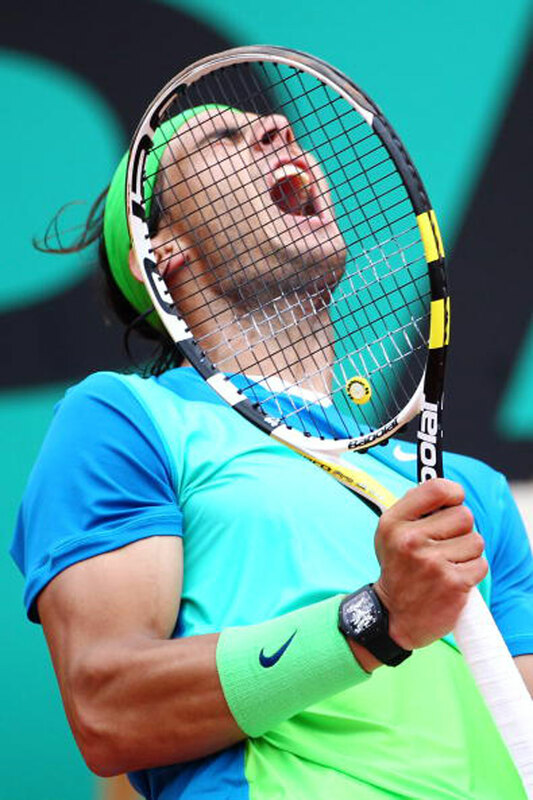 As a result, Nadal transformed. He became a player who is at the full maturity of his game, with tremendous intelligence and finesse as well as power. Everyone has noticed that he plays totally differently now. He is more subtle, much more creative — he has changed tremendously. If you see today, many players have a 210-220kmh first serve. With Nadal, it is consistently at 185kmh, but the variety and precision of his serve is incredible. What I also found interesting was that he had a double-handed backhand. This meant that even if he wore the watch on his non-master hand, it would definitely suffer tremendous impact each time he hit with his backhand. It became something of a mission for me to convince him to wear the watch when he was playing. This dictated four objectives for the watch I would create: the first was lightness, the second was shock resistance, the third was comfort, and the fourth was no compromise mechanically — which meant for me to create a tourbillon for this watch. Finally, he agreed to try it out with no promises that he would wear it during competitions. I suppose the idea of putting a tourbillon on the wrist of one of the hardest-hitting players in tennis was something that excited me. It would be an act that was totally without compromise, and this is the ethos of my brand. Nadal is an incredible talent. When he was only 12 years old, he was discovered in Spain, and by 13, he was under contract with IMG. They told me that even at that age, they knew he would be in the top five one day. Nadal is also a consummate gentleman. I go to dinner with him and I see him always delighted to sign autographs and to have people take pictures with him. You will never see him smash a racket. A lot of players need to hate their opponents. He is friendly with everyone, yet this doesn’t prevent him from being a warrior on court. When I went to Palma to bring him his watch, I actually had two watches with me. I had the platinum RM 012 of my friend Jean Todt, and I had the RM 027 Rafael Nadal prototype in my pocket. Rafael picked me up at the airport and he was nervous and excited to see what I had, because he would be able to tell instantly if what I had created was plausible for him to wear when he played. He kept saying, “Richard, I want to see it, come on!” I replied to him saying, “I will show you, but you must understand that every gram was a challenge, every gram was a battle!” So I showed him Jean Todt’s watch and he said, “But I cannot play with this watch.” Then after five minutes, I showed him the real watch. He was really shocked because when you have an object that is less than 20 grams in your hand, it is like holding nothing. What is funny is that after this, he started to train with the watch and he came back with a list of requirements. He began telling us about small improvements and so on. Then I encouraged him to really brutalise the watch, to never hold back because I wanted him to forget about it, to never compromise on his performance. At one point, the crown came off; and at another point, the hands flew; and at yet another point, the crystal came off. But each time, it showed us where we had to strengthen the watch. To meet these demands, we had to increase the weight slightly, but the final product is still less than 20 grams. The truth is, if it didn’t have to be a watch that he wore during real competitions, we could have made it much lighter. To make a super-light case, we turned to a material that I introduced to the watch industry with the RM 006, carbon nanofibre. At the time, I wanted to use it on the most critical part of the timepiece, the baseplate, which is the skeleton of the watch. This material is lightweight, shock resistant and stable during thermal variation. The watch we made with it, the RM 006, was actually on the wrist of Felipe Massa when he suffered a horrible crash of over 30Gs, and it survived with not even a need for the slightest adjustment. Now I decided to use an evolutionary product of the carbon nanofibre, the carbon nanotube for the case of the watch. Of course, the objective was to have the case as light as possible, but rigid enough, because the force was so violent it could twist the case. So, instead of a normal three-piececase, I made it monobloc. The watch rides on shock absorbers, or silentblocs. I wanted a case where everything that could be integrated was integrated, so that there were fewer things that could flex. As with all my watches, here, the movement rides on these silentblocs directly on the case. The movement is made from aluminium-lithium, which is a material from aerospace that I introduced into watchmaking with the RM 009. It is completely skeletonised, but observing architectural shapes meant to optimise stiffness. The entire movement is then mounted to the perimeter of the case. The tourbillon is mounted to a special bridge fixed on both sides and into the skeleton frame that rides on these shock absorbers. I wanted to make a movement that was less than four grams — and we managed to create one that weighed 3.83 grams. I decided not to use a sapphire crystal, but a type of high-end Plexiglas you find in racecars. What we did was adapt an extreme machine for a very extreme purpose. One of the big issues ended up being the strap. A normal buckle was hurting Nadal, so finally, we arrived at a type of Velcro strap. I had a few sleepless nights over this strap because I was worried that if it detached during the French Open and fell off, it would be in front of all the cameras of the world. But to be a pioneer, you have to take risks. He wore the watch when he won during the 2010 French Open. Then he won Wimbledon wearing the watch, and he went to South Africa to watch Spain win the World Cup wearing the watch. So he tells me that now, it is his lucky watch. Nadal is an incredibly humble guy and he doesn’t know how to reply to a commentator like John McEnroe when he asks something like, “How can a watch cost USD500,000?” So he replied that this watch is a technical exercise, and I think this is good because I don’t want him to oversell the watch. The fact that he wore it while playing was the best testament he could make.